Long Awaited Move, and Heroic Hijinx! Hello, everyone! To start, I’m finally in my new address. Pretty neat to be in a home with my name on the title. it’s a bit more… cramped… than my last living accomodations? but it’s also a lot more mine, and that’s a pretty sweet feeling so far. We’ll see how things go–and I’m sure that I’ll be able to make it all work out. This means that more writing will be coming from me soon–my poor Patreon supporters. Today is my first day of breathing room in a bit, and then tomorrow I need to clean the old place, but… I think it’ll go all right. I’m in much better shape than my old desk–now in pieces. So with that in mind, the subject line for this post is Heroic Hijinx, isn’t it? I want to talk about the books I’ve read recently. 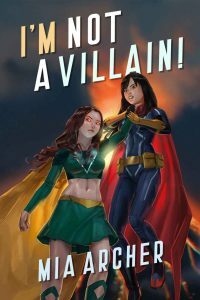 I do a lot less reading than an author should, but recently, basically by accident, I stumbled across the works of one Mia Archer… and saw she had super heroine lesbian fiction. 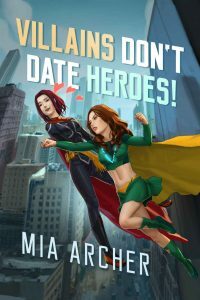 So I had to dive in with the first novel, Villains Don’t Date Heroes! Night Terror, or Natalie (or Natnat as I call her because I’m a dork and so is she) is an incredibly adorkable villain. She calls herself the greatest super villain the world has ever seen, and it’s hard to argue that she’s not impressive. Her city is hers–more or less… then Fialux shows up. (Her name might mean fire light, and I think is pronounce fee-uh-lou? It’s so pretty) She’s your classic kryptonian template. Strength, invulnerability, flight.. and she breaks all the rules, and beats Night Terror down… but is there maybe more going on than either of them knows that could bring them together? Night Terror is in her own head a lot… and I mean a lot. It’s charming to me, but sometimes it did feel like barely anything happened in a chapter, early on at least. It reminds me of some of my early writing, and there were times when I was tempted to drop it… but oh was it worth it. It was such a charming, good story, and a “Villainous” perspective can be fun to indulge time to time. Of course the joke to this is that Night Terror is much more of a heroine who doesn’t much care for law, traditional order, and thinks her tyrannical fist would be better for the world. That’s not GOOD, but honestly, with how much she actually terrorizes people… it’s arguable she’s less harmful than the police in our world. In book two, Villains Don’t Save Heroes, we get to see Fialux and Night Terror grow closer. They have shared enemies, romantic moments, and the writing instantly improves. I don’t want to harp on anything or insult Mia–because I love her prose–but the first book and some of this one had some rough patches. By the end of this book those are practically gone, and you just get to see Night Terror exploring her sexuality–even if the eroticism isn’t on the page. It’s good stuff, and I kinda don’t want to spoil anything. 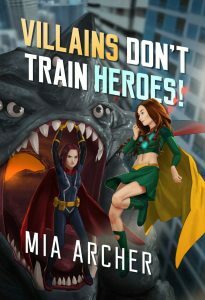 In Villains Don’t Train Heroes we get a story that’s beginning to end cuteness between the two even if poor Fialux is having a problem… her girlfriend is there to help her solve it. Natalie and Fialux make a great couple, and it keeps bringing out the hero in Natalie. The villain may be teasing into Fialux, but who knows–she’s far too pure for that, too incorruptible for that, right? The story sadly ends with them being split up–but not romantically. Circumstance. Physically. One of them is ripped across the cosmos… and the next two books are an amazing exploration of what happens next. 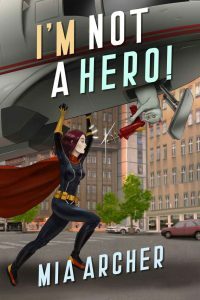 I’m Not A Hero and I’m Not A Villain take place at the same time–sort of. You should read Hero first, then Villain, as hero spoils the end of villain, but then… villain spoils the end of hero, so… I’d recommend publishing order! We see what they’re like apart, now that they’ve had each other. Fialux is on her own, and Night Terror is basically back to where she began… but neither of them can really be the same person anymore. Night Terror continues to protest too much about not being a heroine, while being more and more heroic than ever… and Fialux? Well… maybe Night Terror has rubbed off on her more than just during their intimate moments alone. So why do I of all people bring these up? Well while Silver Girl is currently in redrafting, it is very close to being released on Amazon–physical and epublishing. I’m so excited. 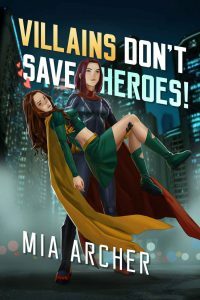 Super Heroines are a thing I really enjoy reading, writing, and pondering… and this series is good for that. It’s also good if you like a character who is a total nerd making silly nerd references, but that feel more like how people actually make them–at least queer women–as opposed to Ready Player One’s vomit of references. It’s chock full of mind control. The first story has two major uses, and one alluded. The latest two are just chock full. There’s more that we don’t know the full details about, and more revealed all the time. The thing is, I don’t want to go in depth into anything spoilery… because I want you to read them. I want these books to be successful, so that I have someone to talk about them with. Give them a look! Leave a review! Show this great author that their work is appreciated. That’s all for me for now! This week’s release, Coping Mechanism, is a story of angst, grief, romance, loss, and lust. It’s different than my standard faire… but I think if you give it a try? You’ll find you just may like it. For now, take care of yourselves, and each other.